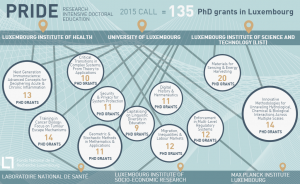 The first Call in the FNR’s PRIDE programme has generated 135 FNR-funded PhD positions in Luxembourg, spread over 11 doctoral training units and six of the country’s research domains. 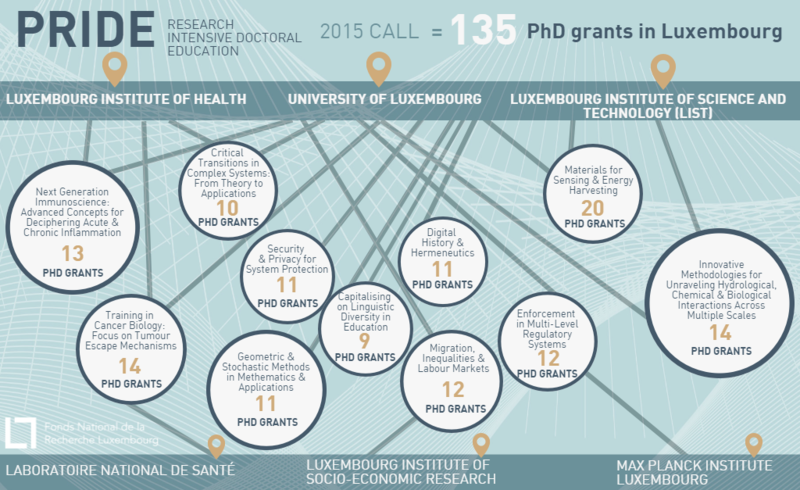 In addition to the 135 FNR-funded doctoral candidate positions, around 20 further PhD positions are to be funded by the Luxembourg host institutions. PRIDE, launched in 2015, is the FNR’s new programme for funding doctoral research in Luxembourg. Under this programme, a block of PhD grants is awarded to a consortium of excellent researchers grouped around a coherent research and training programme. PRIDE is open to all domains of research and technological development. The 135 PhD positions generated through the 2015 Call are to be filled between 2016 and 2018, with the next PRIDE Call anticipated to launch in 2017. All PhDs funded through PRIDE will receive employment contracts with their host institutions – candidates can be funded for up to 4 years. Additionally, each PhD candidate can take advantage of training and mobility allowance of 6500 EUR, which can be used for e.g. courses, summer schools, and international conferences, throughout the duration of the doctorate. Below is an overview of the doctoral training programmes funded as part of the first PRIDE Call. Interested applicants should consult the title links for more information, as well as the individual coordinating institutes’ websites.